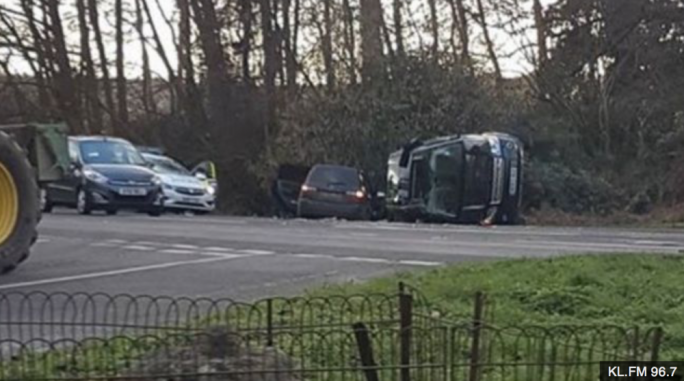 Prince Philip, 97, was not injured after the Range Rover he was driving was involved in a car crash on Thursday afternoon. Buckingham Palace said the Duke of Edinburgh had just left the Queen's Sandringham estate when he was involved in a crash with another car with two people inside. The two people were treated for minor injuries. The duke's car overturned on impact. Prince Philip was reported to have been "shocked and shaken" by the accident and was seen by a doctor at Sandringham as a precaution. At 97, the duke insists on driving himself around. When the Obamas visited Britain in 2016, the duke had driven the US presidential couple and his wife, the Queen.